For several decades, federal policymakers have passed environmental laws to limit pollution, preserve environmental quality, and promote human health. Despite seemingly noble intentions, not all outcomes from these laws have been beneficial. The Institute of Political Economy (IPE) at Utah State University examined how and why negative consequences arise from what appear to be good environmental laws. IPE found that environmental laws can intentionally and unintentionally cause economic or environmental harm. Policymakers can allow markets, property rights, and common law to solve environmental issues without the shortcomings of laws and regulations. 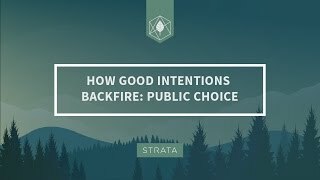 Intentionally or unintentionally, negative consequences result from seemingly good environmental policies. Politicians and bureaucrats aren’t all-knowing and can’t always foresee the environmental and economic implications of their policies. Politicians and bureaucrats often use laws and regulations strategically to fulfill their own preferences and to benefit themselves. The Wilderness Act of 1964 protects some of America’s most undeveloped land from ever being developed. Many people value the idea of undeveloped land, but limiting how we can manage our federal land has real consequences. By limiting active management, wildfires and insect infestations are becoming more common in these beloved places. Many wilderness areas allow between 25 and 35 horses, mules, donkeys, llamas, or goats per party, but disallow age-old activities like biking. Created in 1970, NEPA requires government agencies to research and analyze the environmental impacts from proposed government projects. The cost of completing NEPA requirements has increased over the past several decades, and these costs are passed on to taxpayers. 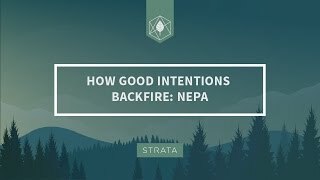 NEPA doesn’t require any cost-tracking, making it difficult to account for agency spending, and nearly impossible to conduct benefit-cost analyses. Government agencies over-prepare NEPA documentation to avoid litigation, adding unnecessary time, money, and 34 pages per year to the NEPA process. The Clean Air Act of 1970 was meant to improve and protect air quality in the United States. The CAA distorts the economy by favoring old companies at the expense of new ones. Federal standards for new sources of pollution are more strict, providing existing polluters an unfair advantage in the market. The cost to comply with air quality standards has increased over time, which incentivizes manufacturers to relocate overseas. Less developed countries then face the burden of dirtier air. The Clean Water Act of 1972 shifted water pollution control from state to federal management. The CWA’s ill-defined wording has expanded the power of bureaucratic agencies, leaving industries unsure of what the regulations actually are. After 40 years and hundreds of billions of taxpayer dollars, government agencies have failed to assess over half of US waters. Sixty percent of assessed waters do not meet water quality regulations. The EPA desginated 100 million acres as wetlands under federal protection, 80 million of which are private property, limiting how property owners can develop their own land. Created in 1980, CERCLA gives the EPA power to clean hazardous waste sites. Although CERCLA helps clean up America’s hazardous waste, decades of evidence show that the law has not been time-effective or cost-effective. CERCLA liability provisions are often unfair and may be unconstitutional. Retroactive liability allows the government to punish people for actions that were legal when they occurred. The EPAct of 2005 was meant to promote domestic energy production and reduce energy consumption. It became a political grab bag that handed out special privileges to politically connected energy industries. The EPAct has distorted energy markets by giving billions of dollars in subsidies and loan guarantees to nearly every energy industry, including fossil fuels, renewables, and nuclear. It contains the Renewable Fuel Standard (RFS), which requires fuel refiners to purchase and blend fossil fuels with certain amounts of renewable fuel, hurting the Corn Belt economically and environmentally. Current government solutions for environmental issues have shortcomings, but policymakers have many tools they can use. Policies could contain market-based incentives that would allow for unique solutions to diverse problems. Common law and property rights promote accountability because polluters are held liable for any damage they inflict. Free markets facilitate innovation and entrepreneurship that can help find solutions to many environmental issues.